Vectrex collector and hardware freak Rudy assembled a high quality and great looking cabinet version for the Vectrex system. It features a complete and safe housing for the Vectrex and high quality parts for the game controls. 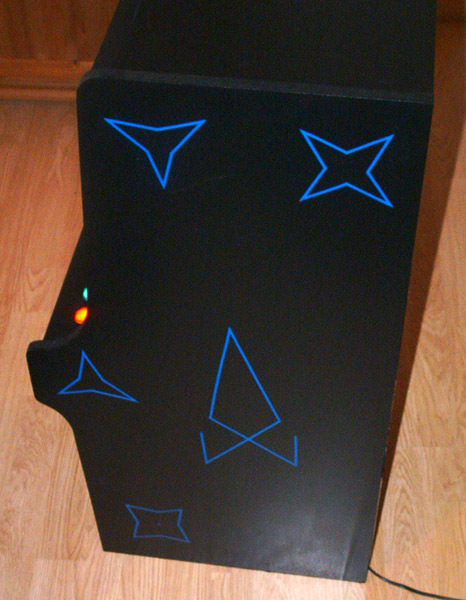 The cabin controls are connected via the standard connection port to the Vectrex, there is no need for changes on the Vectrex system itself. 85 cm height, 45 cm depth, 34 cm width. There will be a limited production of only 5 VecArcade "Series One" Construction Kits, in collaboration with VectrexMuseum who owns the #1 model. A Sticker including the production number, the production date and the name of the first owner will be attached to the VecArcade. All "Series One" Vecarcade have been sold - please contact Oliver if you are interested in a "Series Two". 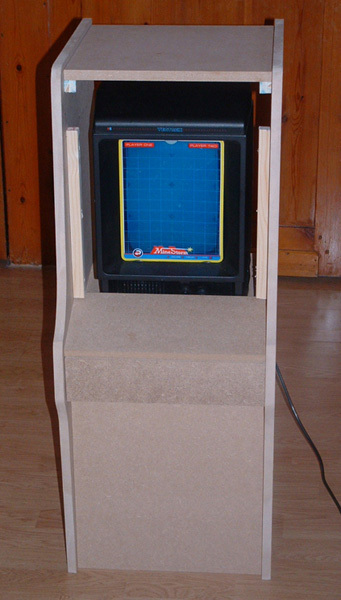 There is no Vectrex System included in the Construction Kit - you need to use your own one. You also need to get some wood glue, a screwdriver for the build up and a standard power supply 12v DC 1.5A (not included because of international plug differences). The power supply is used to illuminated the controller buttons. If you are in Germany, Rudy will be in Berlin in November and he can transport a VecArcade from France to Germany - Oliver can send it then within Germany to reduce shipping costs. 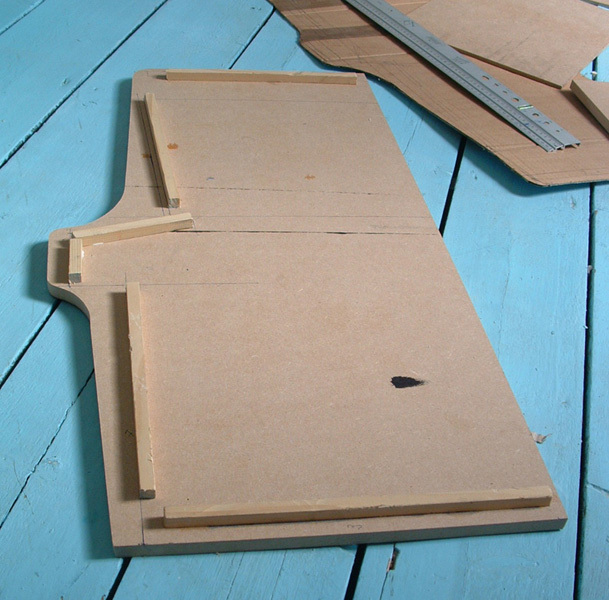 Photos of the prototype build up process. 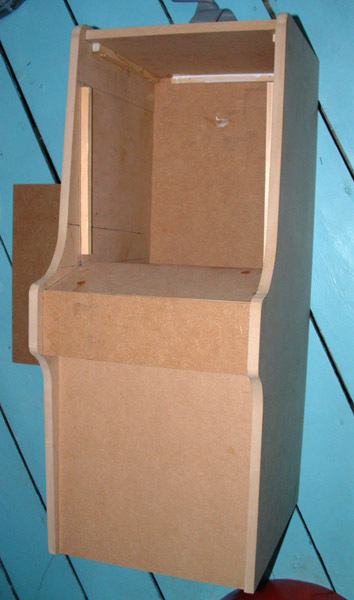 All work is made by hand, much calculation was needed to give the case the original "Donkey Kong cabinet in half size" optic. 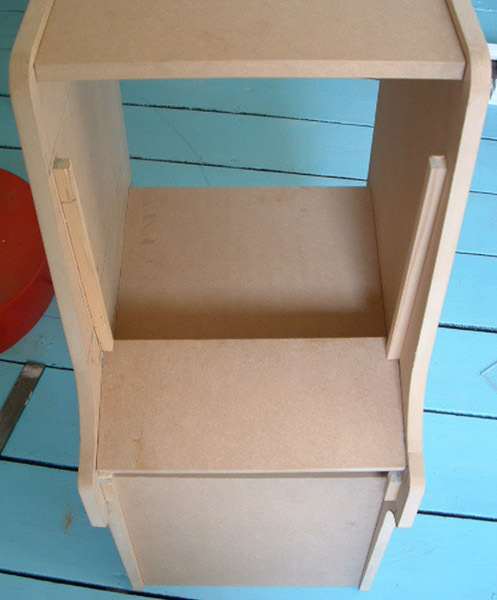 Here you see the uncolored prototype cabin, all parts are glued and screwed together. You need to buy some wood-glue for the build of your construction kit - glue is not included. The bottom plate for the Vectrex system is added. 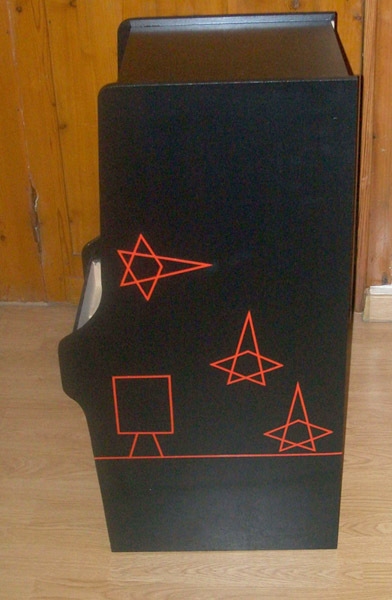 The back cover plate has been installed - it is removable and you can always get your Vectrex system out of the box easy and at any time. Adding the Vectrex system for the first time. Vectrex position is adjusted to the screen of plexy, more adjustment is needed. Please note: because of space issues you can only add game cartridges without the cart case to the Vectrex, the best choice is a Muticart with on screen menu to select the games. With a Multicart you can change the games without the cart. 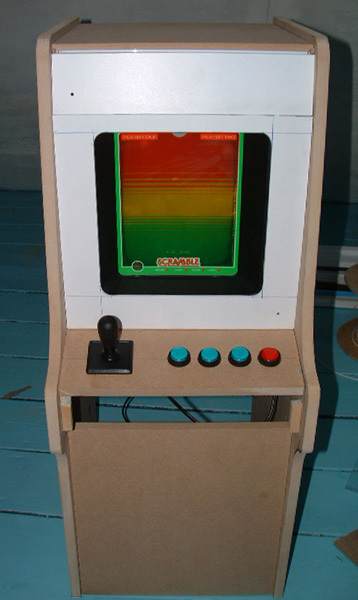 Our first choice is Andrew´s 72 Game Multicart. The control panel uses high quality parts. 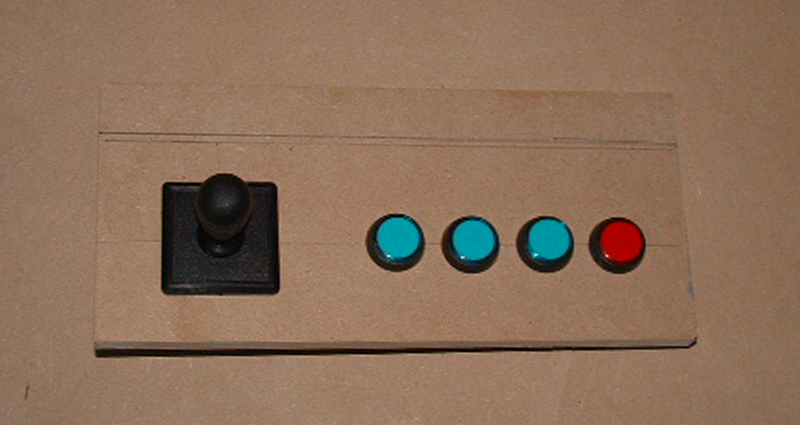 Push buttons are illuminated in the dark and a printed board circuit is used to adapt the joystick to the Vectrex unit. You do not need an original Vectrex controller - you can save your original! The measurement mask for the plexyglass cover. The finished MineStorm case design. You can choose between two case designs for your Version - the blue MineStorm or the red Scramble design (bellow). All artwork is made by Rudy and every VecArcade will have some differences in the layout. On the left you see the illuminated fire button. The finished Scramble case design. This is the first Prototype of the Series One. 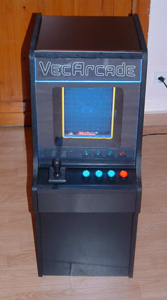 The finished VecArcade including the plexy screen and Logo. 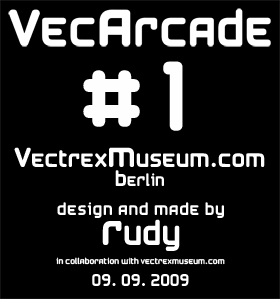 This is the "nameplate" sticker on the VecArcade #1 including the production number, the owners name (here VectrexMuseum.com), hometown and the production date. Only four more "Series One" VecArcades will be build and because of time issues its not sure if there is a "Series Two". If you are interested in a VecArcade Construction Kit you should act fast, this is a limited offer. Please contact Oliver to reserve your VecArcade. International Play Your Vectrex Day once more, slated for November 1st, marking the month of the debut of the Vectrex many years ago!